Old Spice collectibles range in value from $5 to $300. They include a variety of containers and promotional products made during the brand's ninety-year history. The Shulton Company, owned by William Lightfoot Shultz, was the original producer of the Old Spice line of products. His son, George Shultz, was responsible for making the Old Spice a multi-billion dollar, international brand. In 1937, the first Old Spice product produced was the Early American Old Spice for Women. It was a combination of roses, cloves, herbs and other spices, packaged with a colonial theme. The packaging was simple and attractive; so that once the product was gone, the container could be repurposed. Despite its humble beginning during the depression, the line prospered and a men's line began the following year. In the realm of collectible memorabilia, Old Spice items are relatively easy to date. You can figure out the production period by the logo, which changed based on a number of factors including date and product type. The oldest containers featured the ship Grand Turk. It appeared continuously until the 1990s. Over the years, they continued to add new ships. In 1941, the ship Friendship made its debut on the cologne bottle. The 1946 cologne bottle bears the ship Recovery. In all, Old Spice containers portrayed 16 different ships. In the 1990s, when Proctor and Gamble purchased the brand, the ship became a sailboat. There are two kinds of mugs in the Old Spice line, one for shaving and one for drinking coffee. 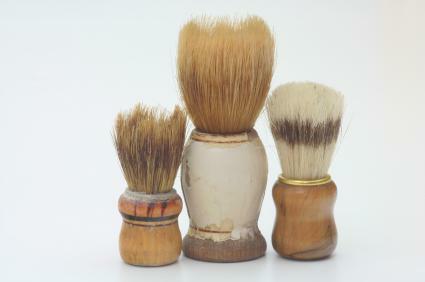 The first shaving mugs in 1938 contained shaving soap packaged in a wood veneer box. After the beginning of WWII, the boxes switched to cardboard. Shulton produced mugs for its international market as well. The most collectible include Canadian, English and Belgian mugs. One of the most expensive and rare mugs is an English mug produced between 1969 and 1984. Made by Wade Pottery in England, it features a ship on one side and an Old Spice inscription on the other. It comes with a porcelain cover and sells for approximately $285. Old Spice coffee mugs existed primarily in the 1980s. The most common is the "Morning Refresher"; a tall, rimmed mug sold in a gift set along with aftershave lotion and shave cream. There are two types of this mug, one decorated with the Old Spice ship and one plain. The plain mug is worth nearly double. Other Old Spice coffee mugs include the Nissan mug and the Canadian coffee mug. Both are rare and sell for around $50. The original Old Spice aftershave and cologne bottles were made of pottery with a metal stopper. The A. E. Hull Pottery Company produced them. In 1946, the bottles switched to glass. Though the graphics, dimensions and colors update and change occasionally, the bottle's general appearance has not changed. One of the most valuable Old Spice bottles contained Lime aftershave or cologne. Valued between $15 and $20, the green, glass bottle sold between 1966 and 1991. Old Spice also produced a variety of other bottles including talcum powder bottles and shakers, travel-sized bottles and novelty bottles. Shulton grouped its products into gift sets almost from the beginning, trying a number of different combinations. Old Spice gift set values vary. You can purchase a 1953 aftershave and talcum travel set for $10. For $70, you can purchase a 1938 set containing a shave mug, aftershave, cologne, bath soap and talcum. There are a myriad of other Old Spice products and containers. Old Spice hair care products, shaving accessories, beer steins, sporting goods, advertisements and novelty items are also collectible. For a more complete list, see Old Spice Collectibles.